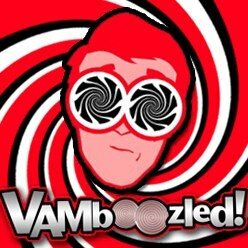 November | 2015 | VAMboozled! New York is one of a handful of states often of (dis)honrable mention on this blog (see for example here, here, and here), given its state Schools Chancellor Merryl Tisch, with the support and prodding of New York Governor Andrew Cuomo, have continuously pushed to have teacher-level growth scores count for up to 50% of teachers’ total evaluation scores. But now, it looks like there is something for which we all, and especially those in New York, might be thankful. A new article titled “The Effect of Summer on Value-added Assessments of Teacher and School Performance” was recently released in the peer-reviewed journal Education Policy Analysis Archives. The article is authored by Gregory Palardy and Luyao Peng from the University of California, Riverside. Before we begin, though, here is some background so that you all understand the importance of the findings in this particular article. In order to calculate teacher-level value added, all states are currently using (at minimum) the large-scale standardized tests mandated by No Child Left Behind (NCLB) in 2002. These tests were mandated for use in the subject areas of mathematics and reading/language arts. However, because these tests are given only once per year, typically in the spring, to calculate value-added statisticians measure actual versus predicted “growth” (aka “value-added”) from spring-to-spring, over a 12-month span, which includes summers. While many (including many policymakers) assume that value-added estimations are calculated from fall to spring during time intervals under which students are under the same teachers’ supervision and instruction, this is not true. The reality is that the pre- to post-test occasions actually span 12-month periods, including the summers that often cause the nettlesome summer effects often observed via VAM-based estimates. Different students learn different things over the summer, and this is strongly associated (and correlated) with student’s backgrounds, and this is strongly associated (and correlated) with students’ out-of-school opportunities (e.g., travel, summer camps, summer schools). Likewise, because summers are the time periods over which teachers and schools tend to have little control over what students do, this is also the time period during which research indicates that achievement gaps maintain or widen. More specifically, research indicates that indicates that students from relatively lower socio-economic backgrounds tend to suffer more from learning decay than their wealthier peers, although they learn at similar rates during the school year. What these 12-month testing intervals also include are prior teachers’ residual effects, whereas students testing in the spring, for example, finish out every school year (e.g., two months or so) with their prior teachers before entering the classrooms of the teachers for whom value-added is to be calculated the following spring, although teachers’ residual effects were not of focus in this particular study. 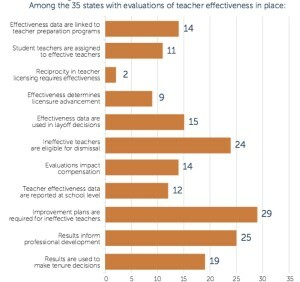 Nonetheless, via the research, we have always known that these summer (and prior or adjacent teachers’ residual effects) are difficult if not impossible to statistically control. This in and of itself leads to much of the noise (fluctuations/lack of reliability, imprecision, and potential biases) we observe in the resulting value-added estimates. This is precisely what was of focus in this particular study. 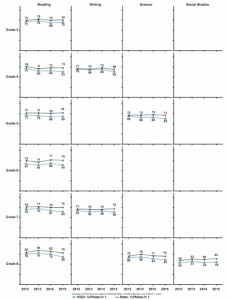 In this study researchers examined “the effects of including the summer period on value-added assessments (VAA) of teacher and school performance at the [1st] grade [level],” as compared to using VAM-based estimates derived from a fall-to-spring test administration within the same grade and same year (i.e., using data derived via a nationally representative sample via the National Center for Education Statistics (NCES) with an n=5,034 children). When summer is omitted from VAM-based calculations using within year pre/post-tests, approximately 51-61% of the teachers change performance categories. What this means in simpler terms is that including summers in VAM-based estimates is indeed causing some of the errors and misclassification rates being observed across studies. Statistical controls to control for student and classroom/school variables reduces summer effects considerably (e.g., via controlling for students’ prior achievement), yet 36-47% of teachers still fall into different quintiles when summers are included in the VAM-based estimates. Findings also evidence that including summers within VAM-based calculations tends to bias VAM-based estimates against schools with higher relative concentrations of poverty, or rather higher relative concentrations of students who are eligible for the federal free-and-reduced lunch program. This is certainly something to consider in terms of trade-offs, specifically in terms of whether we really want to “double-down” on the number of tests we already require our public students to take (also given the time that testing and test preparation already takes away from students’ learning activities), and whether we also want to “double-down” on the increased costs of doing so. I should also note here, though, that using pre/post-tests within the same year is (also) not as simple as it may seem (either). See another post forthcoming about the potential artificial deflation/inflation of pre/post scores to manufacture artificial levels of growth. *I should note that I am an Associate Editor for this journal, and I served as editor for this particular publication, seeing it through the full peer-reviewed process. Yesterday, the Council of the American Education Research Association (AERA) – AERA, founded in 1916, is the largest national professional organization devoted to the scientific study of education – publicly released their “AERA Statement on Use of Value-Added Models (VAM) for the Evaluation of Educators and Educator Preparation Programs.” Below is a summary of the AERA Council’s key points, noting for transparency that I contributed to these points in June of 2014, before the final statement was externally reviewed, revised, and vetted for public release. As per the introduction: “The purpose of this statement is to inform those using or considering the use of value-added models (VAM) about their scientific and technical limitations in the evaluation of educators [as well as programs that prepare teachers].” The purpose of this statement is also to stress “the importance of any educator evaluation system meeting the highest standards of practice in statistics and measurement,” well before VAM output are to carry any “high-stakes, dispositive weight in [such teacher or other] evaluations” ( p. 1). As per the main body of the statement, the AERA Council highlights eight very important technical requirements that must be met prior to such evaluative use. These eight technical requirements should be officially recognized by all states, and/or used by any of you out there to help inform your states regarding what they can and cannot, or should and should not do when using VAMs, whereas “[a]ny material departure from these [eight] requirements should preclude [VAM] use” (p. 2). As per the conclusion: “The standards of practice in statistics and testing set a high technical bar for properly aggregating student assessment results for any purpose, especially those related to drawing inferences about teacher, school leader, or educator preparation program effectiveness” (p. 4). Accordingly, the AERA Council recommends that VAMs “not be used without sufficient evidence that this technical bar has been met in ways that support all claims, interpretative arguments, and uses (e.g., rankings, classification decisions)” (p. 4). For a recent article in the Houston Chronicle, the newspaper sent 12 current candidates for the Houston Independent School District (HISD) School Board a series of questions about HISD, to which seven candidates responded. The seven candidates’ responses are of specific interest here in that HISD is the district well-known for attaching more higher-stakes consequences to value-added output (e.g., teacher termination) than others (see for example here, here, and here). The seven candidates’ responses are of general interest in that the district uses the popular and (in)famous Education Value-Added Assessment System (EVAAS) for said purposes (see also here, here, and here). Accordingly, what these seven candidates have to say about the EVAAS and/or HISD’s teacher evaluation system might also be a sign of things to come, perhaps for the better, throughout HISD. The questions are: (1) Do you support HISD’s current teacher evaluation system, which includes student test scores? Why or why not? What, if any, changes would you make? And (2) Do you support HISD’s current bonus system based on student test scores? Why or why not? What, if any, changes would you make? To see candidate names, their background information, their responses to other questions, etc. please read in full the article in the Houston Chronicle. I do not support the current teacher evaluation system. Teacher’s performance should not rely on the current formula using the evaluation system with the amount of weight placed on student test scores. Too many obstacles outside the classroom affect student learning today that are unfair in this system. Other means of support such as a community school model must be put in place to support the whole student, supporting student learning in the classroom (Fonseca). No, I do not support the current teacher evaluation system, EVAAS, because it relies on an algorithm that no one understands. Testing should be diagnostic, not punitive. Teachers must have the freedom to teach basic math, reading, writing and science and not only teach to the test, which determines if they keep a job and/or get bonuses. Teachers should be evaluated on student growth. For example, did the third-grade teacher raise his/her non-reading third-grader to a higher level than that student read when he/she came into the teacher’s class? Did the teacher take time to figure out what non-educational obstacles the student had in order to address those needs so that the student began learning? Did the teacher coach the debate team and help the students become more well-rounded, and so on? Standardized tests in a vacuum indicate nothing (Jones). I remember the time when teachers practically never revised test scores. Tests can be one of the best tools to help a child identify strengths and weakness. Students’ scores were filed, and no one ever checked them out from the archives. When student scores became part of their evaluation, teachers began to look into data more often. It is a magnificent tool for student and teacher growth. Having said that, I also believe that many variables that make a teacher great are not measured in his or her evaluation. There is nothing on character education for which teachers are greatly responsible. I do not know of a domain in the teacher’s evaluation that quite measures the art of teaching. Data is about the scientific part of teaching, but the art of teaching has to be evaluated by an expert at every school; we call them principals (Leal). Student test scores were not designed to be used for this purpose. The use of students’ test scores to evaluate teachers has been discredited by researchers and statisticians. EVAAS and other value-added models are deeply flawed and should not be major components of a teacher evaluation system. The existing research indicates that 10-14 percent of students’ test scores are attributable to teacher factors. Therefore, I would support using student test scores (a measure of student achievement) as no more than 10-14 percent of teachers’ evaluations (McCoy). No, I do not support the current teacher evaluation system, which includes student test scores, for the following reasons: 1) High-stakes decisions should not be made based on the basis of value-added scores alone. 2) The system is meant to assess and predict student performance with precision and reliability, but the data revealed that the EVAAS system is inconsistent and has consistent problems. 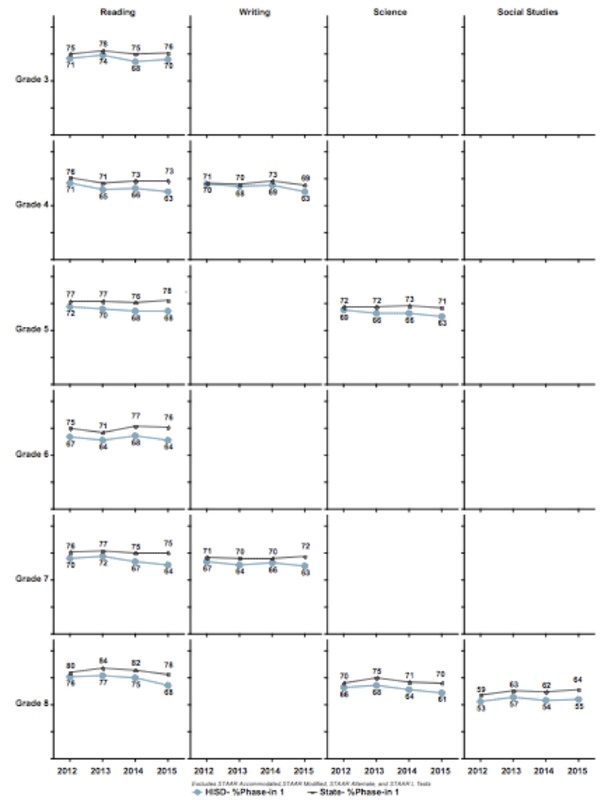 3) The EVAAS repots do not match the teachers’ “observation” PDAS scores [on the formal evaluation]; therefore, data is manipulated to show a relationship. 4) Most importantly, teachers cannot use the information generated as a formative tool because teachers receive the EVAAS reports in the summer or fall after the students leave their classroom. 5) Very few teachers realized that there was an HISD-sponsored professional development training linked to the EVAAS system to improve instruction. Changes that I will make are to make recommendations and confer with other board members to revamp the system or identify a more equitable system (McCullough). 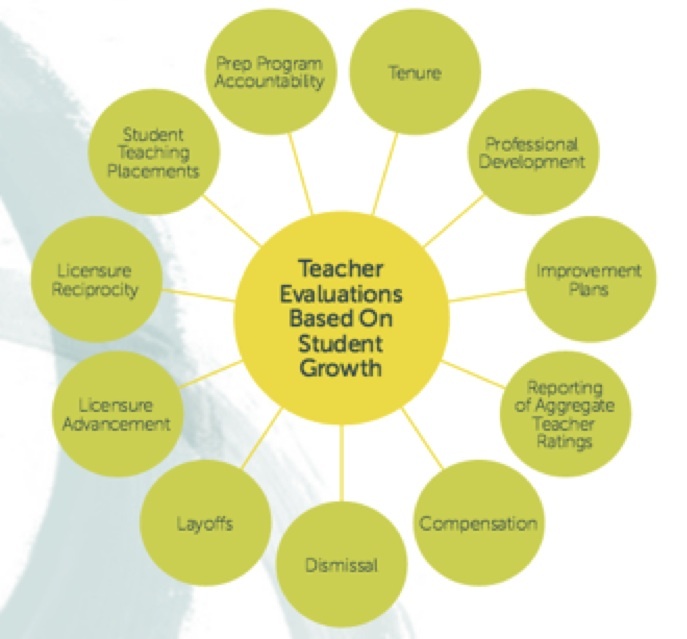 The current teacher evaluation system should be reviewed and modified. While I believe we should test, it should only be a diagnostic measure of progress and indicator of deficiency for the purpose of aligned instruction. There should not be any high stakes attached for the student or the teacher. That opens the door for restricting teaching-to-test content and stifles the learning potential. If we have to have it, make it 5 percent. The classroom should be based on rich academic experiences, not memorization regurgitation (Skillern-Jones). I support evaluating teachers on how well their students perform and grow, but I do not support high-stakes evaluation of teachers using a value-added test score that is based on the unreliable STAAR test. Research indicates that value-added measures of student achievement tied to individual teachers should not be used for high-stakes decisions or compared across dissimilar student populations or schools. If we had a reliable test of student learning, I would support the use of value-added growth measures in a low-stakes fashion where measures of student growth are part of an integrated analysis of a teacher’s overall performance and practices. I strongly believe that teachers should be evaluated with an integrated set of measures that show what teachers do and what happens as a result. These measures may include meaningful evidence of student work and learning, pedagogy, classroom management, knowledge of content and even student surveys. Evaluators should be appropriately trained, and teachers should have regular evaluations with frequent feedback from strong mentors and professional development to strengthen their content knowledge and practice (Stipeche). I do not support the current bonus system based on student test scores as, again, teachers do not currently have support to affect what happens outside the classroom. Until we provide support, we cannot base teacher performance or bonuses on a heavy weight of test scores (Fonseca). No, I do not support the current bonus system. Teachers who grow student achievement should receive bonuses, not just teachers whose students score well on tests. For example, a teacher who closes the educational achievement gap with a struggling student should earn a bonus before a teacher who has students who are not challenged and for whom learning is relatively easy. Teachers who grow their students in extracurricular activities should earn a bonus before a teacher that only focuses on education. Teachers that choose to teach in struggling schools should earn a bonus over a teacher that teaches in a school with non-struggling students. Teachers who work with their students in UIL participation, history fairs, debate, choir, student government and like activities should earn a bonus over a teacher who does not (Jones). Extrinsic incentives killed creativity. I knew that from my counseling background, but in 2011 or 2010, Dr. Grier sent an email to school administrators with a link of a TED Talks video that contradicts any notion of giving monetary incentives to promote productivity in the classroom: http://www.ted.com/talks/dan_pink_on_motivation?language=en. Give incentives for perfect attendance or cooperation among teachers selected by teachers (Leal). No. Student test scores were not designed to be used for this purpose. All teachers need salary increases (McCoy). No, I do not support HISD’s current bonus system based on student test scores. Student test scores should be a diagnostic tool used to identify instructional gaps and improve student achievement. Not as a measure to reward teachers, because the process is flawed. I would work collaboratively to identify another system to reward teachers (McCullough). The current bonus program does, in fact, reward teachers who students make significant academic gains. It leaves out those teachers who have students at the top of the achievement scale. By formulaic measures, it is flawed and the system, according to its creators, is being misused and misapplied. It would be beneficial overall to consider measures to expand the teacher population of recipients as well as to undertake measures to simplify the process if we keep it. I think a better focus would be to see how we can increase overall teacher salaries in a meaningful and impactful way to incentivize performance and longevity (Skillern-Jones). No. I do not support the use of EVAAS in this manner. More importantly, ASPIRE has not closed the achievement gap nor dramatically improved the academic performance of all students in the district (Stipeche). No responses or no responses of any general substance were received from Daniels, Davila, McKinzie, Smith, Williams. Here is another post from our “Concerned New Mexico Parent” (see prior posts from him/her here and here). This one is about New Mexico’s A-F School Grading System and how it is not only contradictory, within and beyond itself, but how it also provides little instrumental value to the public as an invalid indicator of the “quality” of any school. What do you call a high school that has only 38% of its students proficient in reading and 35% of its students proficient in mathematics? A school that needs help improving their student scores. What does the New Mexico Public Education Department (NMPED) call this same high school? A top-rated “A” school, of course. Readers of this blog are familiar with the VAMs being used to grade teachers. 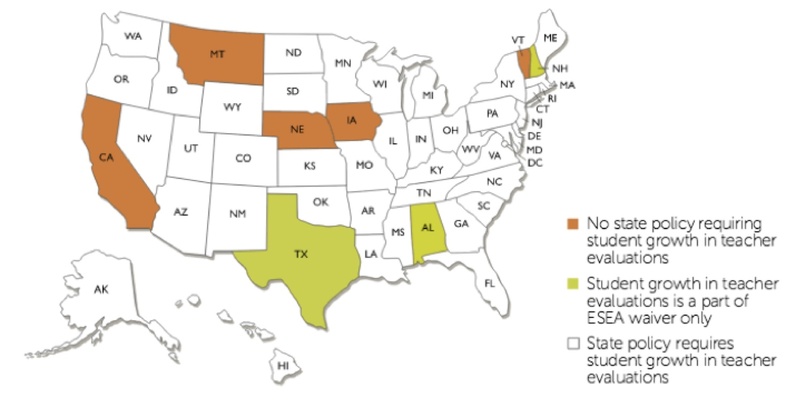 Many states have implemented analogous formulas to grade entire schools. This “forgotten” VAM suffers from all of the familiar problems of the teacher formulas — incomprehensibility, lack of transparency, arbitrariness, and the like. The first problem with the A-F Grading System is inherent in its very name. The “A-F” terminology implies that this one static assessment is an accurate representation of a school’s quality. As you will see, it is nothing of the sort. The second problem with the A-F Grading System is that is is composed of benchmarks that are arbitrarily weighted and scored by the NMPED using VAM methodologies. Thirdly, the “collapsing of the data” from a numeric score to a grade (corresponding to a range of values) causes valuable information to be lost. Table 1 shows the range of values for reading and mathematics proficiencies for each of the five A-F grade categories for New Mexico schools. For example, to earn an A rating, a school can have between 37.9% and 94.0% of its students proficient in reading. In other words, a school can have roughly two-thirds of its students fail reading proficiency yet be rated as an “A” school! The median value listed shows the point which splits the group in half — one-half of the scores are below the median value. Thus, an “A” school median of 66.2% indicates that one-half of the “A” schools have a reading proficiency below 66.2%. In other words, in one-half of the “A” schools 1/3 or more of their students are NOT proficient in reading! Amazingly, the figures for mathematics are even worse, the minimum proficiency for a B rating is only 4.9% proficient! Scandalous! Obviously, and contrary to popular and press perceptions, the A-F Grading System has nothing to do with the actual or current quality of the school! A few case studies will highlight further absurdities of the New Mexico A-F School Grading System next. Logan High School, Logan, New Mexico received the lowest reading proficiency of any “A” school, and the Albuquerque Institute of Math and Science received the highest reading proficiency score. These two schools have both received an “A” rating. The Albuquerque Institute had a reading proficiency of 94% and a mathematics proficiency rating of 93%. Logan HS had a reading proficiency of only 38% and a mathematics proficiency rating of only 35%! 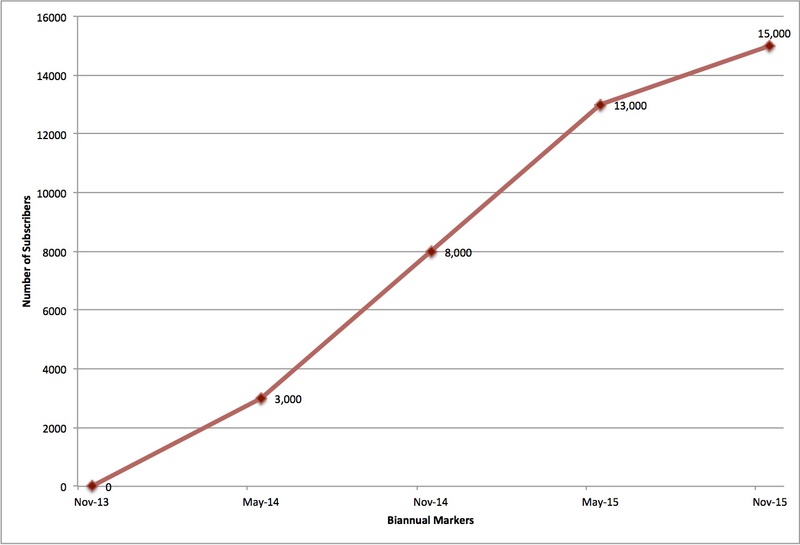 First, much of the A-F VAM, like the teacher VAM is based on multi-year growth calculations and predictions. Logan has plenty of opportunity for growth whereas the Math Academy has “maxed” out most of its scores. Thus, the Albuquerque Institute is penalized in a manner analogous to Gifted and Talented teachers when teacher-level VAM is used. With already excellent scores, there is little, if any, room for improvement. Second, Logan has an emphasis on shop/trade classes which yields a very high college and CAREER readiness score for the VAM calculation. Also, a final factor is that the NMPED-defined range for an “A” extends from 75 to 100 points, and Logan barely made it into the A grouping. Thus, a proficiency score of only 37.9% is no deterrent to an A score for Logan High. As noted above, any school that scores between 75 and 100 points is considered an “A” school. This statistical oddity was very beneficial to Hagerman High (Hagerman, NM) in their 2014 School Grade Report Card. They fell 5.99 points overall from the previous year’s score, but they managed to still receive an “A” score since their resulting 2014 score was exactly 75.01. With this one one-hundredth of a point, they are in the same “A” grade category as the Albuquerque Institute of Math and Science (rated best in New Mexico by NMPED) and the Cottonwood Classical Preparatory School of Albuquerque (rated best in New Mexico by US News). This inaccuracy and arbitrariness of any A-F School Grading System was also apparent in a recent Albuquerque Journal News article (May 14, 2015) which reported on the most recent US News ratings of high schools nationwide. The Journal reported on the top 12 high schools in New Mexico as rated by US News. It is not surprising that most were NMPED A-rated schools. What was unusual is that the 3rd and 5th US News highest rated schools in New Mexico (South Valley Academy and Albuquerque High, both in Albuquerque) were actually rated as B schools by the NMPED A-F School Grading System. According to NMPED data, I tabulated at least forty-four (44) high schools that were rated as “A” schools with higher NMPED scores than South Valley Academy which had an NMPED score of 71.4. None of these 44 higher NMPED scoring schools were rated above South Valley Academy by US News. Many school districts and school boards throughout New Mexico have adopted policies that prohibit punitive grading based on behavior. It is no longer possible to lower a student’s grade just because of their behavior. The grade should reflect classroom assessment only. NMPED ignores this policy in the context of the A-F School Grading System. Schools were graded down one letter grade if they did not achieve 95% participation rates. One such school was Mills Elementary in the Hobbs Municipal Schools District. Only 198 students were tested; they fell 11 short of the 95% mark and were penalized one “grade”-level. Their grade was reduced from a “D” to an “F” In fact, Mills Elementary proficiency scores were higher than the A-rated Logan High School discussed earlier. The likely explanation is that Hobbs has a highly transient population with both seasonal farm laborers and oil-field workers predominating in the local economy. For more urban schools, it will be interesting to see how the NMPED policy of punitive grading will play out with the increasingly popular Opt-Out movement. It is apparent that the NMPED’s A-F School Grading System rates schools deceptively using VAM-augmented data and provides little of any value to the public as to the “quality” of a school. By presenting it in the form of an “NMPED School Grade Report Card” the state seeks to hide its arbitrary nature. Such a useless grade should certainly not be used to declare a school a “failure” and in need of radical reform. It’s our two year anniversary, so I thought I would share our current stats and our thanks to all who are following (n ≥ 15,000), and also sharing out our independent, open-access, research- and community-based content. We still have a lot of work to be done in terms of America’s test-based teacher evaluation systems, but I feel like we are certainly having a positive impact on the nation writ large, again, with thanks to you all!! On that note, if there are others (e.g., teachers, students, parents, administrators, school board members, policy advisers, policymakers) who you might know but who might not be following, please do also share and recommend. 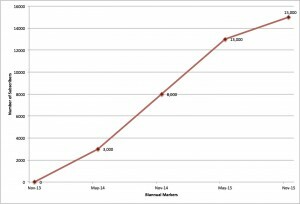 We have also made public 295 posts, to date, averaging 2.8 posts per week and 12.3 post per month. *This number is calculated by ((subscribers x average number of posts per month) + external hits per month)), although external hits may also include subscribers as analytics cannot differentiate between subscribers and hits. These two indicators are not mutually exclusive.